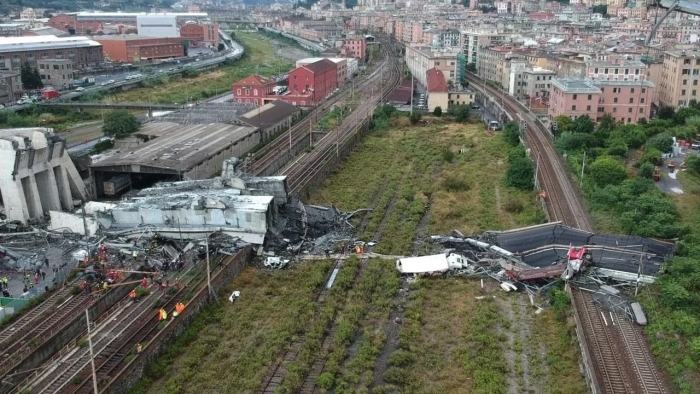 In total 43 people were killed by the collapse of the structure – also known as the Morandi Bridge after its designer – carrying the A10 motorway (link opens in new tab). The commission set up by the Ministry of Infrastructures & Transport (MIT) is chaired by architect Roberto Ferrazza, provider of public works for Piedmont, Liguria and Val d'Aosta. The other members are Professor Ivo Vanzi (member of the Board of Public Works), Antonio Brencich (of the University of Genoa) and engineers Gianluca Ievolella (advisor to the Superior Council of Public Works), Michele Franzese and Bruno Santoro (technical managers in the directorate general for the supervision of motorway concessions). The inspection commission must provide the MIT with a report on the established facts within 30 days. The commission will also determine whether there have been violations on the part of Autostrade per l'Italia, the concessionaire responsible for the road. The MIT said that the investigation aims to assess the possibility of severing the concession agreement. Autostrade per l'Italia is required to make available all pertinent documents, as well as providing the commission with any information to get to the root cause of the tragedy.